Unique Christmas trees – that kids will love! Would you like an alternative Christmas tree just for your child’s room, or at least a Christmas tree-like decoration for them? I find that kids love to bring a little bit of Christmas into their own rooms when they can, so a mini tree or some Christmas decorations just for them, is a popular idea. Alternatively, finding a really fun tree that the whole family can enjoy, could be another way to get their input! There are some unique Christmas tree ideas out there that your kids will love – here are my top picks for some creative Christmas tree ideas! 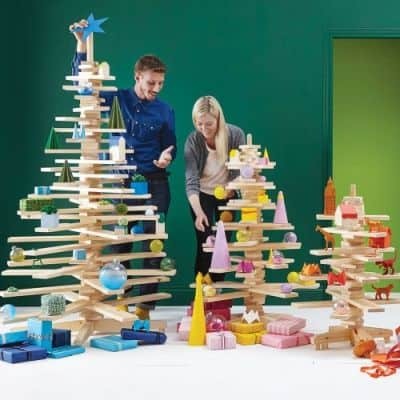 Here is an alternative wooden Christmas tree that is both simple and fun to put together! The kids could spend hours having fun constructing it and no need to worry about the gazillion pine needles on the floor or the never ending puzzle of “which branch goes where,” when it comes to the artificial trees. I love this idea and actually, it would be a great way of storing little presents on the “branch” shelves. You could also put other little items on there, like chocolates, cupcakes or even toys that haven’t been wrapped but just placed in different places on the tree on Christmas eve. There are three sizes available, with the smallest being perfect for a child’s bedroom. A gorgeous idea this one – A colouring in Christmas Wall Sticker! A really nice way for your child to have their own tree in their room and one they can personalise by colouring in themselves! A high quality vinyl wall sticker, this one can easily be coloured in using felt tips or colouring pencils. The wall sticker can easily be removed without residue. You can also check out more Christmas wall stickers here. 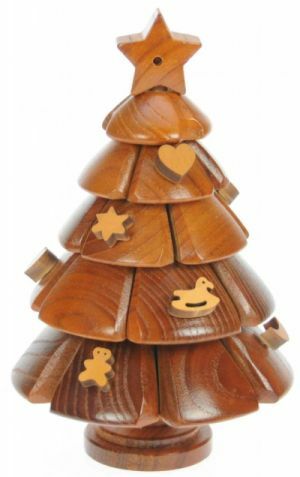 This is a beautiful hand crafted wooden 3D Christmas tree puzzle. No, this one won’t be for replacing your traditional tree but would make a lovely additional decoration in your home or in your child’s room. Plus. it has the additional bonus element of being an educational toy – it’s easy to pull a part, but will be a challenge to fit back together! My children would go absolutely wild for this inflatable tree! It’s suitable for both in and outdoor use and has an inbuilt LED light. Fully self-inflating – so you’ll not be running out of puff! 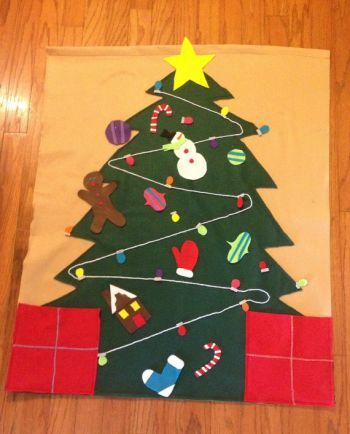 This felt Christmas tree for kids to decorate themselves would make a great decoration for your kids room – as they can continue to decorate it and swop items around all Christmas. Something like this would also be simple to make, simply by buying some felt and craft supplies from somewhere like Hobbycraft and cutting out appropriate Christmas felt shapes ready to stick on. However, if you want the convenience of having one ready made, then you can always purchase one like this. 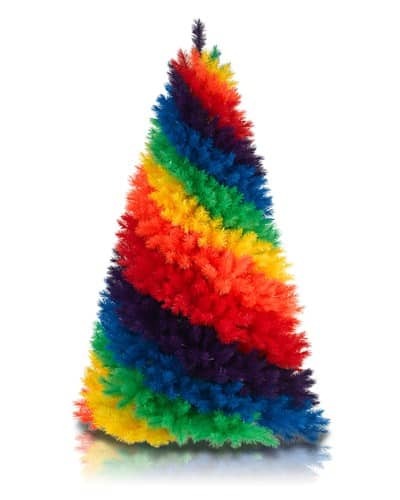 I absolutely love this Rainbow tree and am sure plenty of kids would too. If you’re looking for a fun and flamboyant tee, that’s super colourful, then this will fit the bill! Although you could decorate it, it would look stunning enough with just some simple twinkle lights. Or you could go all out and fill the tree with quirky and equally unique ornaments. 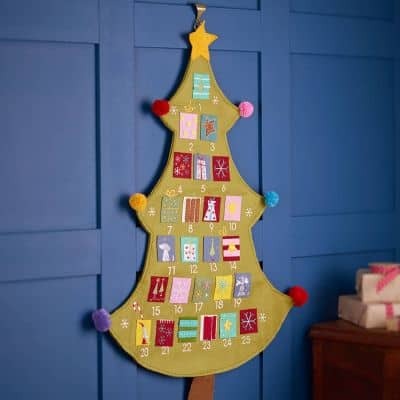 Obviously this cannot be used as a real replacement for a tree, but as an additional tree on your child’s room wall as decoration and it also doubles up as an advent calendar! One thing my kids are huge fans of is LIGHTS and having a tree like this is really simple, because you don’t have to struggle trying to untangle metres of wire lights to try and wrap them around the tree and really, you don’t need ornaments on it either! (unless you want to of course). 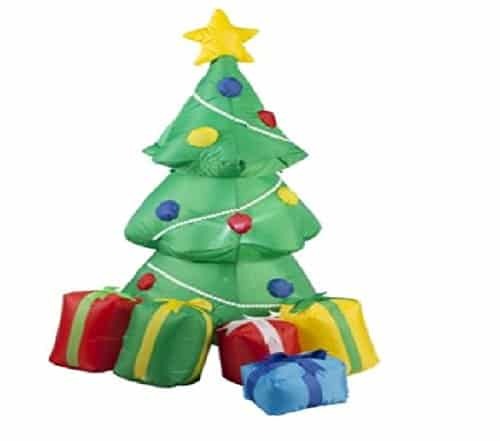 Large Inflatable Christmas Tree – With Disco Lights! 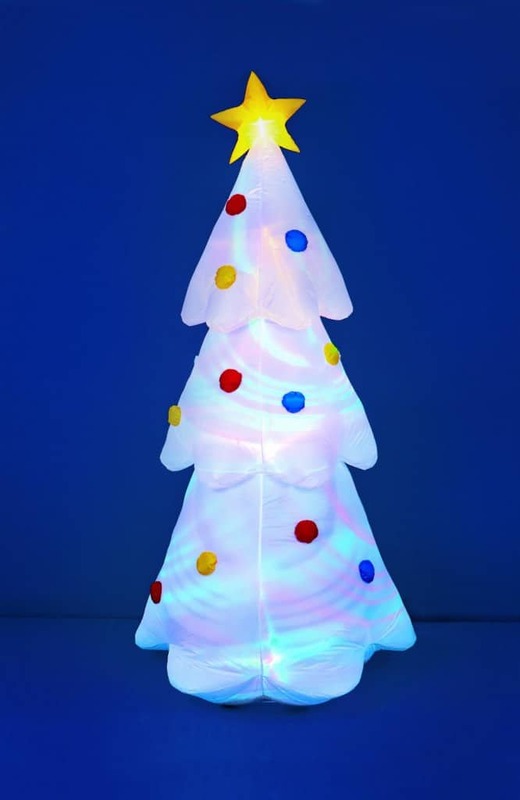 I had to include another fun inflatable Christmas tree – this one also has a unique feature, as it’s illuminated by flashing disco lights inside! Now, this is a very large tree and so perhaps best for outside use. You’d certainly make an impact having it in your garden! Lastly, if you have a mountain of recycling, (or fancy collecting off others) why not have a go at creating a DIY tree! It wouldn’t just need to be egg boxes, let your imagination run wild – any materials that need recycling could be painted and either placed, fixed or glued together to create a really fun Christmas tree project that the kids can be involved in. Add some sparkly decorations and lights and you could create a very unique Christmas tree indeed – while recycling at the same time! I came across this tree creation over at Toovia.com. Check out some additional creative Christmas tree ideas in the video below! Don’t forget, you can also check out some great Christmas Wall Stickers at my designated post here. What is the most unusual Christmas tree you’ve ever seen? Why not leave me a comment below! If you enjoyed this post, I’d appreciate any shares! Many thanks! These are fantastic alternative ideas for creating a Christmas tree for 2015. As a green advocate, I totally love the idea of using egg boxes as props. I was just about to throw away some card boxes in the garage but you’ve just given a creative project to work on for the holiday season. I thought it was a pretty cool idea and definitely something the kids would love. My own son does not stop creating things, he loves anything art and craft related so I know he’d love the idea. WOW! This is such a coincidence. I was just bonding with my daughter sticking stickers to her paper cut christmas tree! HAHA! I love your suggestions. I might consider one next year since I already have my DIY Christmas tree for this year, the 2nd year I’m trying to go unconvential:) Will bookmark this post:) Thanks! lol you’re welcome – paper christmas trees are also a good idea actually! I was just about to start a post about some giant colouring in Christmas trees that you can get, which look awesome. Good luck with your DIY project! – and merry christmas! These are really unique and awesome ideas for creating a Christmas tree. I totally love the “Wall Sticker” and the “eggs box”. they look creative and also they are fun. And of course they are much cheaper than usual trees. You might just save many trees this year. 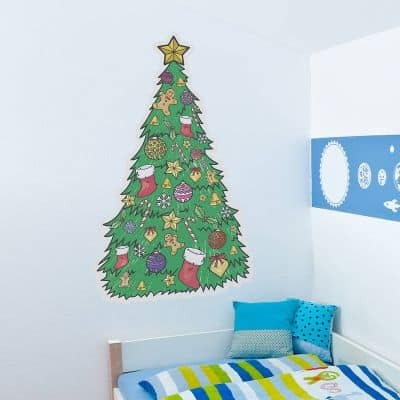 You’re welcome – yes I love the colouring in wall sticker christmas tree. There are also some other Christmas tree wall stickers here. I think we’ll still be having a traditional tree too, but it’s nice for the children to decorate their room too. Merry Christmas! I will surely get my son the Christmas tree wall sticker and perhaps do the Egg box christmas tree together as a family. WoW this is amazing. You could not have picked a better time to write your unique Christmas trees articles as Christmas is around the corner. My favourite one is the fibre optic light tree. I do not know why, but I am huge fan of lights and all the glitter. I also think that $20 is really not that expensive for this tree. 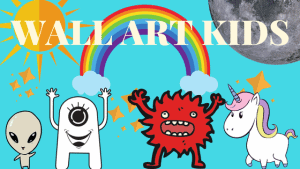 Hi Natalie – these are such fun and unique kids’ Christmas products! I particularly like the Alternative Wooden Christmas Tree, perhaps as a second tree in the home. This is something I have never seen before and I imagine it would make a great conversation piece with guests. I think kids would have a good time helping to set it up each year as a family tradition, and placing small items on the “branches” is a neat idea. Hi thanks for your comment laurie – yes I’m sure they’d love it. I really like the wooden tree too! What an awesome website! It makes me wish that my kids were young again. I love the spiderman bedroom! My son was in love with spiderman. It’s like a one stop shop! You have everything on here to decorate kid’s bedroom! I will send the link to my friend who was recently asking me how she should decorate her little girl’s room! These trees are so awesome! 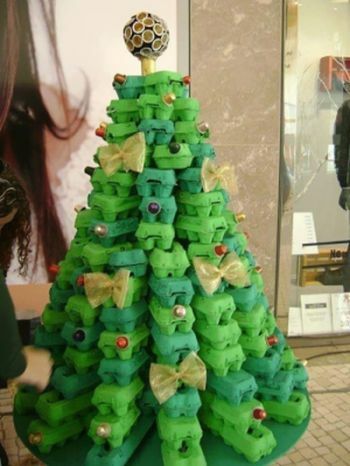 I especially love the tree made out of egg cartons. It is so creative! The only tree I had a problem with was the inflatable one with the disco lights inside, but that probably has more to do with the fact that I have seizures and wouldn’t be able to watch it than with the tree itself. All in all, a great post! Oh dear, yep that would be a problem! I love the crafty egg carton christmas tree too — thanks for your comment! 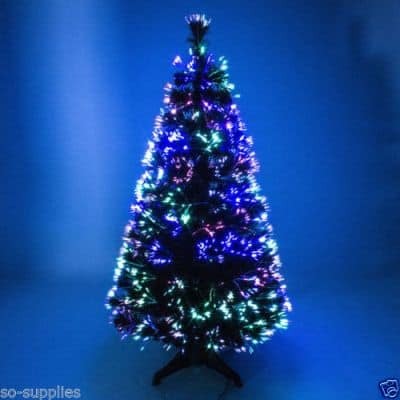 There are sure some unique tree ideas that kids will love here, and at relatively cheap prices as well. The rainbow tree is something different but I think the one that does it for me and perhaps a lot of kids is the the inflatable design. What a great idea! I especially like the wall sticker. I’ve been trying to come up with ways to incorporate Christmas into my kids’ bedrooms. They are both still small, but now I’m thinking of getting some clings or wall stickers to place in their rooms. Thanks for the inspiration!